Leek – Queen of the Moorlands (updated 2018-11-05) | A balanced diet . . .
April 1956. Did my world fall apart? I probably thought so at the time. 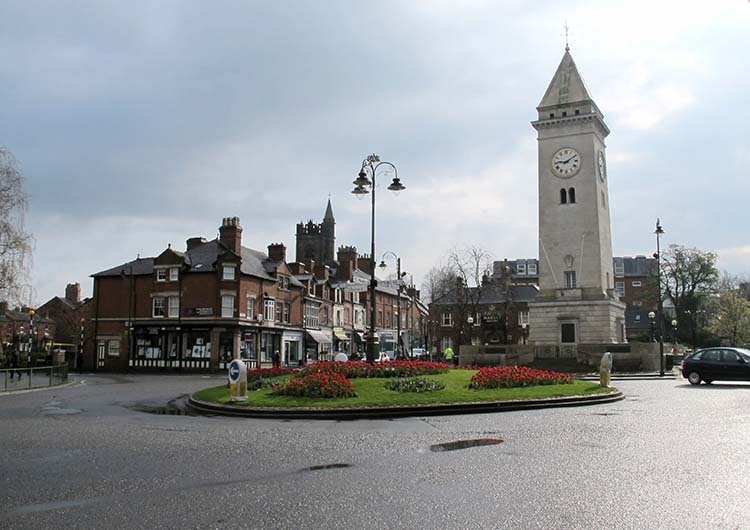 We moved from Congleton in Cheshire (where I was born seven years earlier) to the small market town of Leek in north Staffordshire. Less than 12 miles away, but it could have been another planet for all I was concerned. New town, new home, new school, and new friends. When I say ‘small market town’ I always was under the impression that Leek had a population of about 20,000 when we moved there in 1956. So I was quite surprised to note in the 2001 census that the population was a smidgen under 19,000. It seems the population has changed very little over the past century. 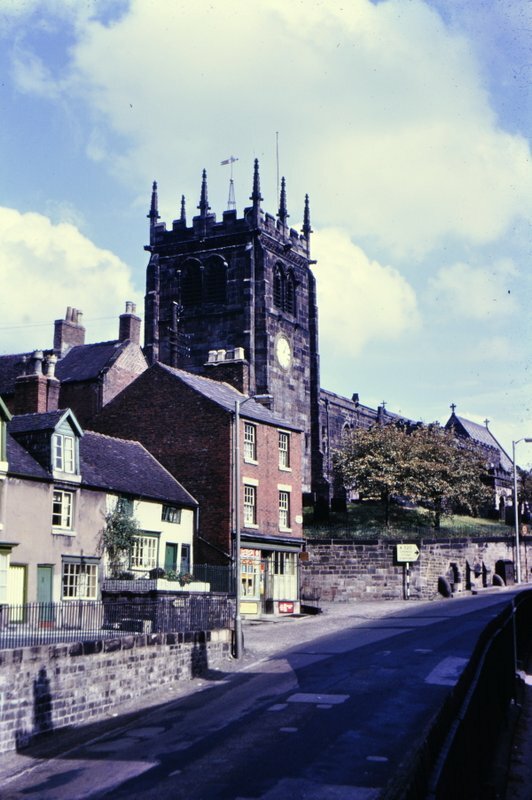 I’m not sure that I could say that Leek is a picturesque town, but it’s certainly a very interesting one, with some remarkable features and history (the link gives a pretty comprehensive account). And it’s surrounded by some of the most glorious landscapes in the country, the Staffordshire moorlands on the southern edge of the Peak District (the UK’s first national park). 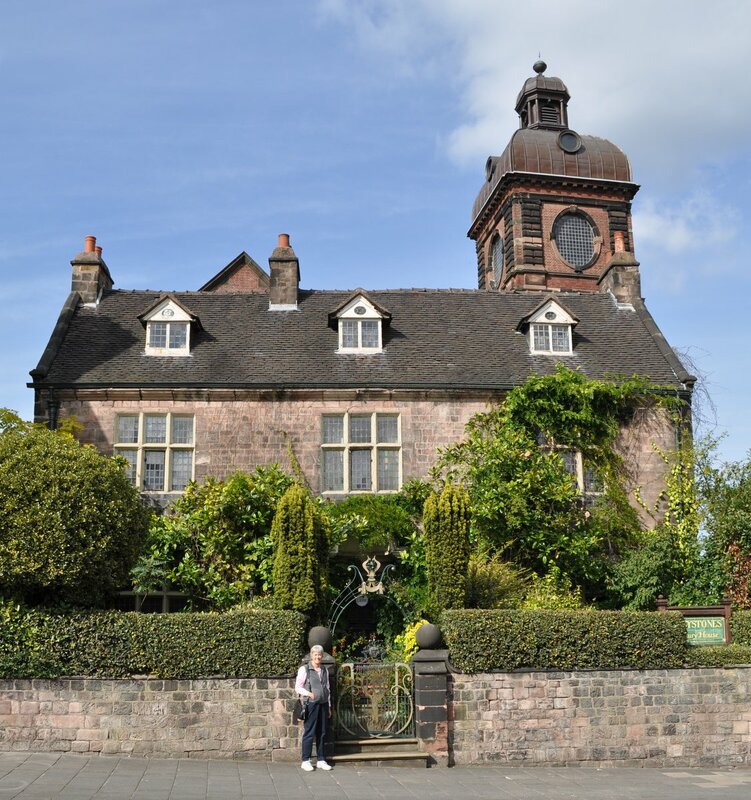 Although I was not born there, and actually only lived there for a little over a decade before moving away to university (and moving on) I still think of Leek as my home-town – and proudly so! In the 1960s panorama below, taken from the top of Ladderedge (on the southwest of the town, besides the main road linking Leek with Stoke-on-Trent – the Potteries) looking towards the northeast, you can see many of the distinctive features of the Leek skyline. Just to left of center is the square tower of the 13th century Anglican Church of St Edward the Confessor (although there is some evidence for a pre-Norman church in the vicinity), and to the right of center, the tall spire of the Roman Catholic church, St Mary’s (which we attended), built in 1887, although there had been earlier churches. To the right of St Mary’s spire is the white clock tower of Leek’s impressive war memorial, the Nicholson War Memorial, commonly known as The Monument (at the eastern end of the main shopping Derby Street), and to the right of that another Anglican church, St Luke’s, with a square tower and a small spire to one side. The Nicholson War Memorial (the Monument), photographed in April 2012. The roundabout has now disappeared – a great local controversy – as part of road ‘improvements’ to ease the flow of traffic. The video below shows its dedication in 1925. And in the middle of the panorama rises the impressive green copper dome (no longer green) of the Nicholson Institute, housing the public library and art gallery (including a facsimile of the Bayeux Tapestry) and (in the past at least when I was growing up) a celebration of much of Leek’s wealth that was built on the silk weaving industry. Indeed, textile manufacturing and dyeing were among the main industrial endeavours in Leek, and quite a few of the mills and their chimneys can be seen on the Leek skyline. In the mid-60s a couple of these were destroyed by fire within the space of just one week – very dramatic happenings in a small town. William Morris, a prominent member of the Arts and Crafts Movement, may have resided in Leek for several years. The central area of Leek is bounded by five streets: St Edward Street on the west, Stockwell Street on the north, Brook Street/Hayward Street on the south, and Ball Haye Street on the east. And these are through routes connecting Leek with Buxton to the northeast, Macclesfield to the north-west, the Potteries to the southwest, and Ashbourne to the east. We lived in a couple of properties in St Edward Street where my father established his photographic retail business between our arrival in Leek in 1956 until 1962. Then my father was able to purchase a prime site in the Market Place, which he kept until his retirement in 1976. I’ve recently discovered that 19 Market Place is now a shop selling home-made jewellery – Little Gem. That’s quite interesting since my wife’s main hobby is making bead jewellery. We must visit next time we are in Leek. But I digress . . .
Leek was granted a charter to hold a market on Wednesdays during the reign of King John at the beginning of the 13th century. And that market thrives today. In the valley of the River Churnet, and on the north-west of the town lie the rather depleted ruins of a Cistercian abbey, Dieulacres; many of the stones were used in local building after Henry VIII’s men had done their business, and particularly in the Abbey Inn that is found close by. The Market Place, c. 1900, looking from north to south. A view over the Market Place (probably in the 1960s) looking north, and taken from the first floor of the Woolworth’s premises (the tall building in the distance in the other photograph). Leek was connected to the growing canal system in 1801, with a branch of the Caldon Canal. It closed in the mid-1940s, and was eventually filled in (now part of an industrial estate on the southeast side of the town). Famous 18th century canal engineer James Brindley lived in Leek for many years. Until the 1960s Leek was served with rail connections, but after these ended, the station was demolished in 1973. The last steam trains from Leek in 1965 are shown in the video below. I read recently of plans to try and reopen the mothballed railway link between Leek and Stoke. The web site has some stunning photos of steam locomotives near Cauldon Lowe. Close by the Monument is the bus station, opened in the 60s on the site of the former cattle market (that moved afterwards close to the site of the old railway station. Thanks to my old friend Geoff Sharratt for sharing these two photos with me. We never talked politics at home. I suspect my parents voted Conservative, but I do not know for sure. When we lived in Congleton my father was elected to the local council – Congleton was a borough with a mayor. Not long after we moved to Leek my father sought election to the Leek Urban District Council – as an Independent since he strongly believed that national political affiliations had little or no place in local government. In 1968 he became Chairman of the Leek Urban District Council. In the 1950s and 60s as I was growing up in Leek the annual Club Day, a 200 year-old tradition, held in mid-July was (and still is, apparently) a very important event in the town’s calendar. Held on a Saturday afternoon, it brought together churches and Sunday schools of all denominations in an ecumenical celebration, held in the Market Place. It was a riot of colour and best outfits, banners and bands, with the children and their parents and friends processing from the individual churches to the Market Place, and afterwards around the town. Today it seems that Club Day in Leek is rather a different celebration altogether. My elder brother Ed and I took part for a number of years with the St Mary’s 5th Leek Cub (cub scout) Pack. Here we are in our Cub uniforms. Me with my brother Ed (r) in our Cub uniforms in the late 1950s. After my parents retired in 1976 they took up residence in a first floor apartment in Greystones, a 17th century town house on Stockwell Street, just in front of the Nicholson Institute. After my mother (and the lady on the ground floor) moved out in the mid-80s, the property became a tea room. Greystones, with the Nicholson Institute behind. But in many ways it’s the location of Leek that is one of its best assets, nestling as it does in the shadow of the Staffordshire Moorlands, with close access to the Peak District National Park, and particularly the Roaches, Dovedale, and the Manifold Valley to mention just a few special places, and the famous ‘double sunset‘ that figures in the old coat of arms (two suns). I visit Leek rather rarely now, but when I do walk around the town, and look at how it has changed over the decades, my mind fills with good memories of a happy childhood. It was good growing up in Leek. And it seems that many around the world also hold fond memories of Leek, as comments on the Visitors’ Book at Leekonline show. And finally, here are some recent photos of Leek that I have put together in a short video. This entry was posted in Musings from the past, Out and about and tagged Leek, Nicholson War Memorial, Peak District, Staffordshire. Thanks for this blog, really enjoyed reading it. There are some great links to follow-up. I shall explore these next week during our week in Leek; perfect timing! I really enjoyed this, brought back lots of memories – thank you. I’ve now edited this and hopefully there is no longer any ambiguity. It should show Leek, Staffordshire Moorlands. Hi, have you got any images of the petrol station that was on the Ashbourne road. It was my grandparents and I understand that it burnt down in 1969. Hello Blaine, Sorry – I can’t help you there. But maybe one or two others who read my blog might be able to help. Found this just today and I am most impressed. I don’t know if you may remember me – John Sheldon. We went to the same Church and school and, of course, the Cubs. We lived in Beech House Off Stanley Street with access down the lane behind ‘The Queen’s Head’ – now The Valiant. I still have 2 brothers in Leek with the rest of us scattered. I live in South Wales. My younger brother is putting together old photos as we are all getting nostalgic in our old age! Great blog, my grandma Mary Dale is on the club day photos,she’s in front of Victoria Wines wearing a pink hat! No photos as such. Only incidental if caught in a panorama. Great old photos. I have some that were taken on Westwood Road, and appear to possibly be around 1900? Any chance your father knows knows any history. My great grandparents lived at 78 Westwood Road I the late 1800’s, and my one great aunt married and lived at 88. Hello Nola, I can’t help, I’m afraid. My father passed away in 1980. Hi Mike. You don’t know me but when I was a child growing up in the 70’s and 80’s, I used to stay with my nan in the school holidays who lived next door to your house (other side of Nicholson Institute entrance) and I befriended a pair of brothers – the eldest being Alex, who also visited their nan. We were inseparable!! I remember one day I was in your house with Alex and he called a radio station for a dedication and they played a track by the Jacksons haha! The elderly lady on the ground floor was a very good friend of my nan. I miss Leek very much and will be up this weekend to celebrate my 50th birthday in one or more of the many drinking holes!!! Tony, I just re-read your comment, and now realise that you were referring to visiting my parents’ home. The two boys would have Ben Alex and Bruce, my nephews, sons of my eldest brother Martin. Oh I didn’t realise they were your nephews. Yes I remember Bruce too and I can see the resemblance of both of the them in your Cub photo. We all used to knock about together during the school holidays…….fond memories. Hi Tony. If I remember correctly, the lady on the groundfloor of Greystones was Elaine Clowes. And I certainly remember the name of Nurse Steele. Hi Mike, thanks for the quick reply. That’s right, it was indeed Elaine Clowes. My nan had paintings painted by her all over the house. I used to pop next door with my mum and visit Elaine and I will always remember her budgie cheeping away in her kitchen. I couldn’t walk down the street with my nan without someone stopping to talk to her haha! How Leek has changed. I certainly miss Dave Evan’s chip shop in Stockwell Street!!!! LOL!